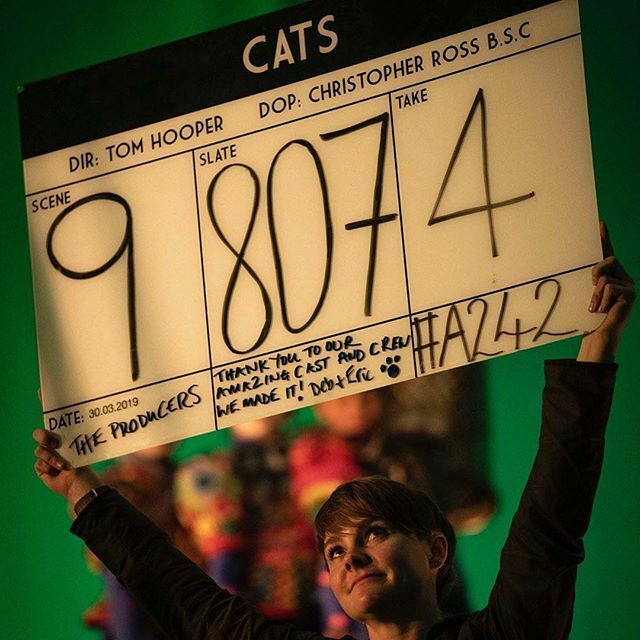 Working Title has shared a new behind-the-scenes photo celebrating that production has wrapped on Tom Hooper’s Cats movie adaptation. You can check out the full photo now in the gallery below! The film stars Tony- and Emmy-winning actor and host James Corden (One Man, Two Guvnors, The Late Late Show with James Corden), Academy Award-winning actress Judi Dench (Shakespeare in Love), multi-platinum-selling singer-songwriter Jason Derulo, Emmy- and Golden Globe-winning actor Idris Elba (HBO’s The Wire, BBC One’s Luther), Academy Award, Golden Globe and Grammy Award-winning artist Jennifer Hudson (Dreamgirls), Academy Award-nominated actor Ian McKellen (Gods and Monsters), Emmy and ten-time Grammy-winning global music icon Taylor Swift, comedy superstar Rebel Wilson (the Pitch Perfect franchise) and introduces Francesca Hayward, principal dancer with The Royal Ballet. Adapted for the screen by Hooper and Lee Hall (Billy Elliot), Cats is produced by Hooper and Working Title’s Tim Bevan and Eric Fellner, as well as Debra Hayward (Les Misérables), who brought the idea to Working Title. The film will be produced by Working Title Films in association with Monumental Pictures and The Really Useful Group and executive produced by three-time Oscar winner Steven Spielberg, musical theater legend Lloyd Webber, Angela Morrison (Les Misérables) and Jo Burn (Annihilation). The world-class creative team bringing Cats to the screen includes Oscar-nominated production designer Eve Stewart (The King’s Speech), cinematographer Christopher Ross (Terminal, Room), Oscar-nominated costume designer Paco Delgado (The Danish Girl), Oscar-winning sound mixer Simon Hayes (Les Misérables), BAFTA-winning executive music producer Marius De Vries (Moulin Rouge, Romeo + Juliet) and renowned casting director Lucy Bevan (Ready Player One, Murder on the Orient Express). The film is scheduled to hit the theaters on December 20, 2019.